Tyler Flowers will enter the season as the Chicago White Sox's starting catcher, though GM Rick Hahn envisions some competition in spring training. CHICAGO -- After missing the last year and a half because of a shoulder injury that required surgery, Jesse Crain makes no promises other than the fact that he will do his best to make the Chicago White Sox roster. Blue Jays CEO Paul Beeston says GM Alex Anthopoulos and manager John Gibbons are welcome back. The Toronto Blue Jays activated right-hander Brandon Morrow and first baseman Dan Johnson from the disabled list. 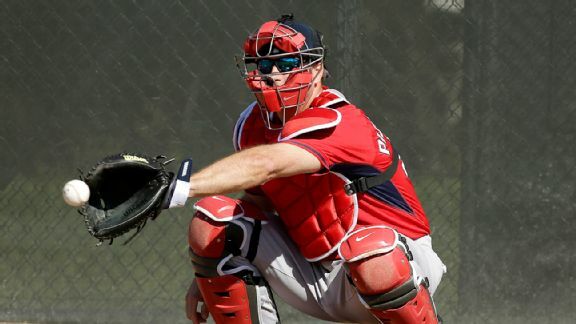 The St. Louis Cardinals have signed veteran catcher A.J. Pierzynski. Free-agent catcher A.J. Pierzynski has reached a deal with the St. Louis Cardinals, a source confirmed to ESPN.com's Jerry Crasnick. The St. Louis Cardinals have claimed veteran George Kottaras off waivers from the Cleveland Indians, bolstering their catching position following the injury to Yadier Molina. The Cleveland Indians are hoping to get Carlos Santana back in their lineup at some point this week, but there's a chance we may have already seen him behind the plate for the last time. The Cleveland Indians placed Carlos Santana on the seven-day disabled list with a concussion and infielder Nick Swisher on the 15-day DL with a left knee injury on Tuesday.